Craftsmen, designers, artists…Tangiers has tons of places to go for shopping and lots of opportunity to bring souvenirs back in your case. Firstly, in the medina, there are the souks of course – unmissable ! 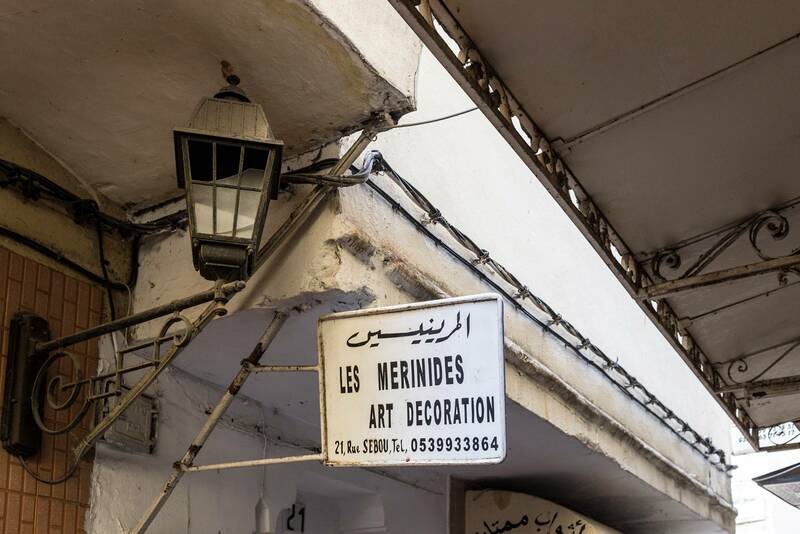 Les Merinides is Hassan’s boutique. There’s Madini (perfumes and essential oils). Spices can be found in the undercover market at the Grand Socco. The weavers, set up in a caravanserail, and who work with traditional looms are not to be missed. There’s also the old jewellery to see, the lanterns, the copper plates and…let’s not forget, you can’t leave without buying a rug ! Secondly, there is the Conil Gallery (7 Rue du Palmier, Tanger), which exhibits artists from Morocco and elsewhere. They are carefully chosen by Olivier Conil, a fine connoisseur of the art world. The not-to-be-missed concept store ‘Las Chicas’ offers a lovely range of creations in a beautiful family house, perched at the entrance of the Kasbah. It’s run by Ayda and Yasmine and everything is carefully selected (you can have tea or lunch there, in the tearoom or on the roof of the terrace). If you go a bit further up the street, towards Amhra place, you’ll find the pretty boutique that sells Rumi candles.. many to choose from…you’ll also pass in front of Marie’s workshop ‘Au fil de Tanger’, in the heart of the Kasbah, along the walls of the Kasbah on the same side of the museum. Go to the Hammam. Nestled in the Kasbah, Odile and David’s is great: “l’abyssin”. (abyssindetanger.com) Authentic, of course, but it’s not the only thing: Refined décor, products have been selected by Odile (a pharmacist), and you’re really welcomed from the start to the end. This is a mixed hammam. A haven of peace (300 dh/pers. Maximum 3 people). So Zen Spa, is another address, for those who wish to spend a relaxing hour with the girls (up to 8 people). It is above the Grand Socco (200 dh/pers). And also, there is Palais Zahia (Petit Socco – tel. no. : 05 39 93 40 00). Price: 200 and 300 dh depending on what you ask for. Opening hours: 9am – 2.30pm or women and 3pm – 11pm for men. If you decide to go to Asilah and/or Chefchaouen there are some beautiful craftsmanship to see. Let yourself be tempted by the slippers and rugs in Asilah. In Chefchaouen, don’t hesitate to go for some stunning walks. You can find all the necessary information at the tourist office in the town. Marie can also point you in the direction of these places and, if you wish, go with you to help you find your way around.